On a trip to Sweden, Alan W. Petrucelli learned that Greta Garbo is reclusive even in death. When I get to my hotel, I ask the clerk: How do I get to Garbo's grave? She makes some calls . . . "after all," she tells me in near-perfect English, "that was a long, long time ago. Most people don't remember her anymore." 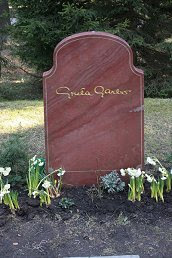 I learn Garbo is buried at Skogskyrkogarden, a huge cemetery outside town. I walk back into the crematorium, round a corner and bam! walk right into a female employee. She is far less startled than I am. I ask how to get to Garbo's grave. "Garbo! You're here to see Garbo?" Her tone is incredulous. "No one comes to see Garbo." Finding Garbo's grave is easy, she insists. "Walk to that parked car. Turn there, turn here, walk there, go here." She punctuates the air with her finger. "You cannot miss it."